Vote for my entry here! 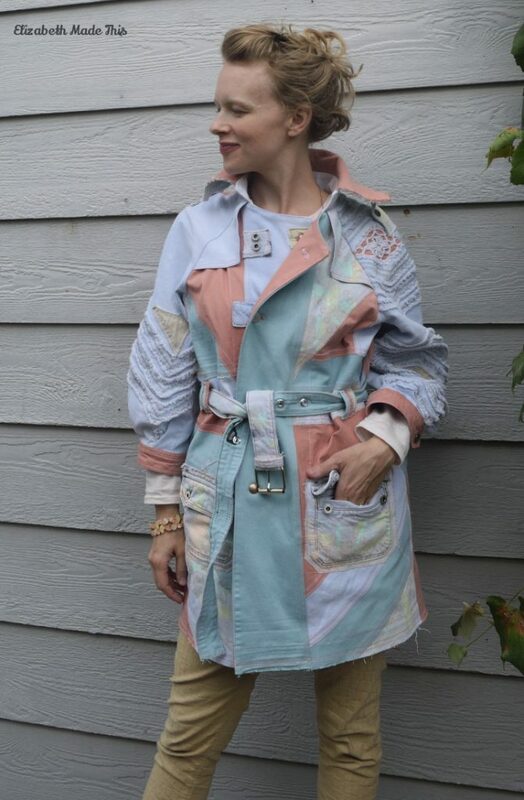 It’s the finals in Fabric Mart’s Fabricista Fashion Challenge, and this week is called “Find your inner designer.” The goal is to make a look that could theoretically fit into a designer’s collection, with the added caveat that the resulting garment(s) should fit into your lifestyle. There is, after all a whole lotta crazy on the runways. The search for my inner designer took me to the Fall 2016 runway shows of Balmain and Miu Miu. I’ve always loved Balmain’s denim, but I was drawn to this show because of the color. As a person who looks best in lighter colors, I love the light airy hues of this show. I’ve never understood why it is that pastel shades are reserved for Spring and Summer in the fashion world. Yay for Balmain and others for challenging that. For this top, I copied a Banana Republic cashmere blend sweater I’ve owned for several years. It has cap sleeves, a scoop neckline + a turtleneck that is tied so that one side of the neck drapes. I love the style so much, and really, I’ve always intended to copy it. I slashed and spread the neckline of my t-shirt pattern’s front to get the gathers. The turtleneck is a 21″ X 14″ rectangle sewn into a tube that’s a giant neck binding. The tie piece is 15″ X 3″ sewn into a tube and tapered at the ends. The velvet for this top came from a nice quality throw blanket I’ve used for guests. It’s stretch velvet on one side and faux fur on the other. Velvet can be really visually heavy due to the fact that it absorbs light. Because of that and because I’ve only ever seen stretch velvets in the dark jewel tones that don’t look the best on me, I’ve never worked with stretch velvet. But this velvet IS one of my colors! The only problem with sewing with velvet is that you have to sew with velvet. And velvet is quite a demanding lady. 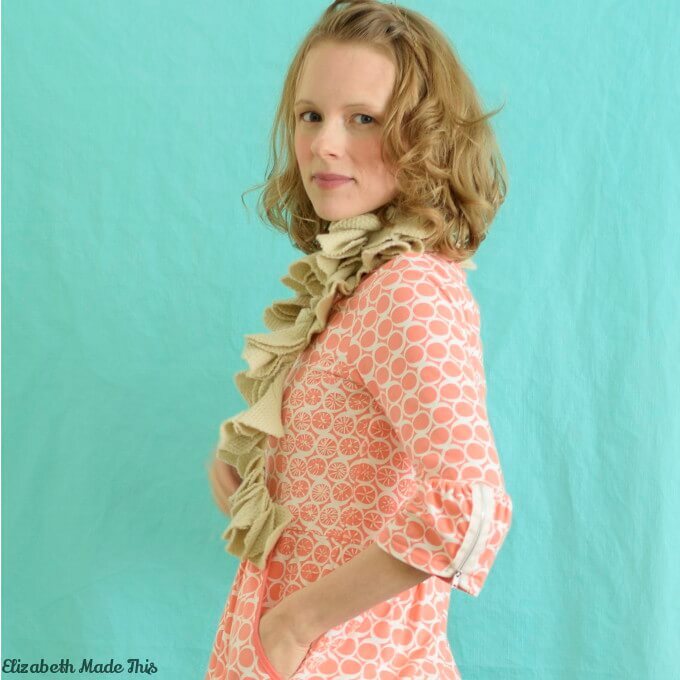 When I cut the pieces for my top, the velvet curled up completely…like Shirley Temple curls. Pins are useless with velvet; they leave holes in it and do not help with the creep factor. Because of velvet’s pile, when two layers of it are together, they will fight against each other and feed at drastically uneven rates. I once made a set of velvet floor pillows and discovered that it is actually possible to cut 2 rectangles of fabric the same size and end up with one seam 4″ longer than the other. To tame the curling and the creep factor, every single seam was hand basted within the seam allowance. I used an extra-fine beading needle so as not to damage the velvet. When hand-basted, the seams sewed up really quite easily. The fabric was so drapey and slippery, that I had to hold the neckline gathers into place while sewing even though I had hand-basted the seam so they didn’t slip out entirely. I had to make a tiny buttonhole on the turtleneck piece that the tie threads through. There’s a layer of lightweight sew-in interfacing between the layers of velvet, and the velvet layers were sandwiched between 2 layers of tissue paper. The paper keeps the velvet moving under the feed dogs and protects the fabric from the friction of the buttonhole foot. I chose to line the top for a clean finish and to cut down on the “show every lump and bump” factor. 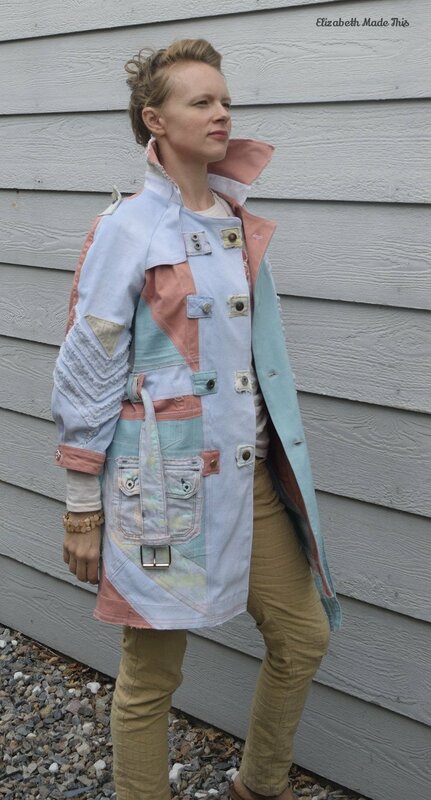 The technique I used is similar to bagging a jacket lining because you end up sewing everything backwards and inside out. To do this, I cut a front and back from stretch mesh 1″ shorter on the hem than the velvet. 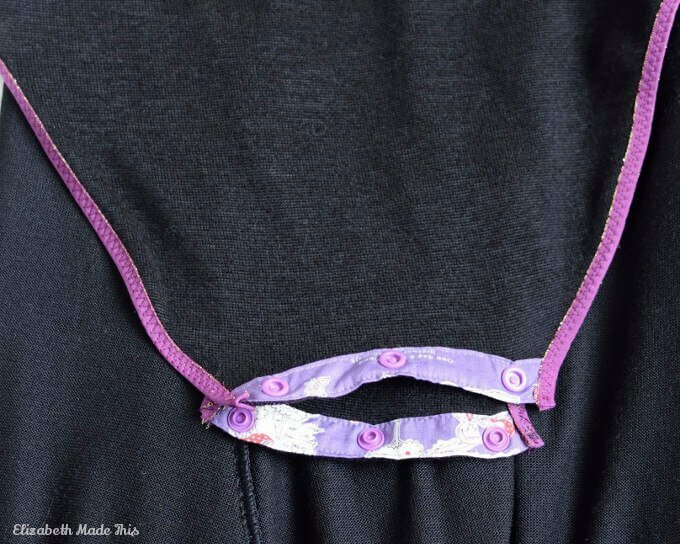 Then you sew the right side of the neck’s lining to the wrong side of the top’s neckline towards the neck so that when you flip it, it rolls towards the body of the garment covering the neck seam entirely. After that, the right side of the lining to the wrong side of the sleeve seams on the side towards the sleeve. Don’t sew completely around the sleeve. 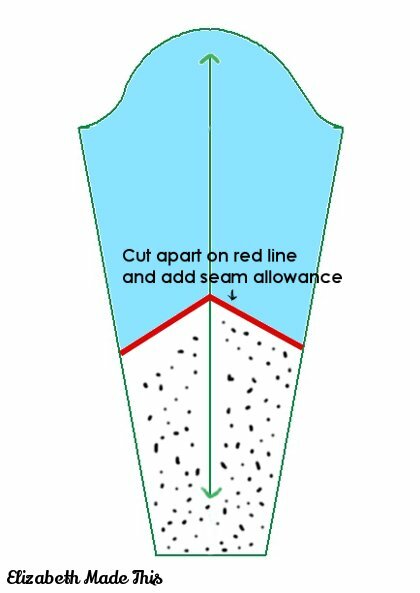 Leave the bottom of the lining’s armscye unsewn the amount of your seam allowance to allow for when you sew the side seams. The lining will cover the raw seams when you turn it right side out inside the top. To finish installing the lining, bring the wrong sides of the side seams together and sew. Leave the lining hanging free or enclose it in the garment’s hem as I did here. A lot of the looks in the Miu Miu show used sweaters and jackets with faux fur cuffs on extra long sleeves. A lot of those cuffs were gathered up slightly with sleeve tabs. I really love the texture of those, so I decided to incorporate those elements into a wool cardigan. I’m using a blush Italian wool pointelle sweater knit I bought from Emma One Sock 3 years ago. The pattern is Burdastyle 3-2013-107. This pattern is a v-neck cardigan with front bands that are gathered along the fronts. I made this pattern a while back, and the original sweater has too much length in the front bands. Out came 1.5″ in the band and I also took out 1.5″ divided between 2 darts in the front that taper to zero at the armscye. I’m not sure what this alteration is, but clearly, there was fullness there that didn’t need to be there. The bands and the upper chest now sit nice and flat. To add the faux fur cuffs, I cut the sleeves 3″ shorter than usual. I drafted a quick cuff pattern that takes up the missing length, and I made it slighter wider than the sleeve. The extra width is needed because the faux fur doesn’t stretch as much as the wool. I also made cover buttons for the front with the velvet. There’s a layer of the same mesh lining I used for the velvet top in each button for opacity. I could not make buttonholes in the fronts because of the narrow bands and the loft of the knit. Instead, I opted to sew the velvet buttons as decoration and use snap tape on the inside for a closure. I hand dyed the snap tape so it wasn’t so stark white. The button tabs have 2 layers of the knit and a layer of fusible interfacing. I cut them from a quick pattern piece I made up. I topstitched each tab to add the tailored look that the Miu Miu pieces have. They’re sewn into the wrong side of each sleeve where the cuff and the sleeve meet. Then they fold up over the top of each sleeve to fasten with a button a little above the cuff. The second collar I made from a vintage lace collar from my Grandmother-in-law’s stash. The lace had a tiny strip of netting meant for you to sew the collar into a neck seam. I sewed 2 pieces of bias tape around the netting to make a collar stand. The elastic loops are sewn between the layers of bias tape. In my research for this challenge, I came across the current trend of jumper dresses. Who knew? I was pretty excited about this. I’m a Mom of 4, and my youngest is nursing. Dresses are tough for me to wear because there’s so many styles that are not nursing-friendly. My solution in the past has been to wear separates. Still, I love wearing dresses. Jumper dresses allow for easy access while still allowing you to wear an actual dress. They also solve another problem for me. 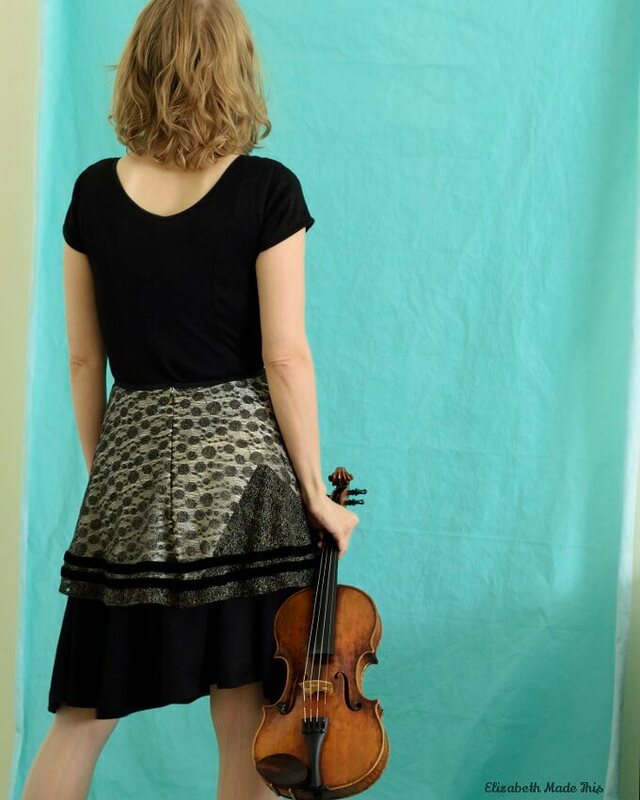 Being a violinist, I need freedom for my shoulders to move. I end up wearing knits 95% of the time that I’m playing and most of the time that I’m not for this reason. Woven fabrics just don’t move as easily. I’m prone to injury in my upper back from this specific overuse of those muscles, so I have to be careful that I don’t wear any fabrics or styles that confine my movement too much. The jumper dress lets me still move around while being able to wear an actual woven fabric. I cut strips of the velvet and folded each in half lengthwise. Hand basting holds each piece of trim together. After making each piece of trim, more hand basting attaches each line of trim to the jacquard. The trim on the button tabs comes to mitres in the corners. I used a beading needle to tack down the trim to the body of the dress. As I was doing this, I tried to catch just the bottom layer of the velvet. 1/2″ dart I rotated out of the back armhole to make the armhole slightly smaller and also take out the back gaping. I took in the side seams 1″ at the bottom of the armhole. This is a dart effectively that tapers back to the seamline at the bottom of the empire waist. Definitely this week was a challenge, but I’m so grateful to have made it to the finals, and I’m glad I was able to complete my goals for this week! You can check out the other entries and vote for mine at the Fabric Mart Blog. This week’s challenge is to “Show some love” to an item in our closets that we don’t wear as much as we could. To do this we were to sew 2 different pieces that can separately coordinate with the unworn item. 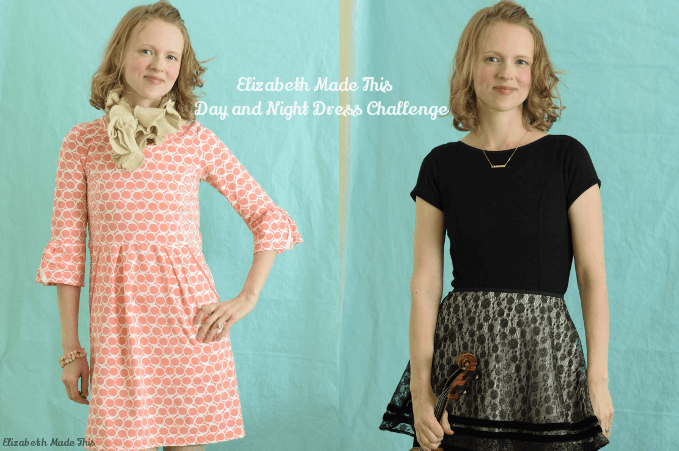 My answers to this challenge are this floral sheath dress and geometric hem tunic. For this dress, I used nice midweight cotton batik I had in my stash. The full lining is brown tricot. This pattern has 4 neckline pleats which I secured with invisible hand stitches. There’s so many darts on this pattern! Between the lining, facing, and the fashion fabric, there’s 20 darts to sew! At the outset, I have to mention that I’m petite. I’m not only shorter than average, but my frame is quite narrow. 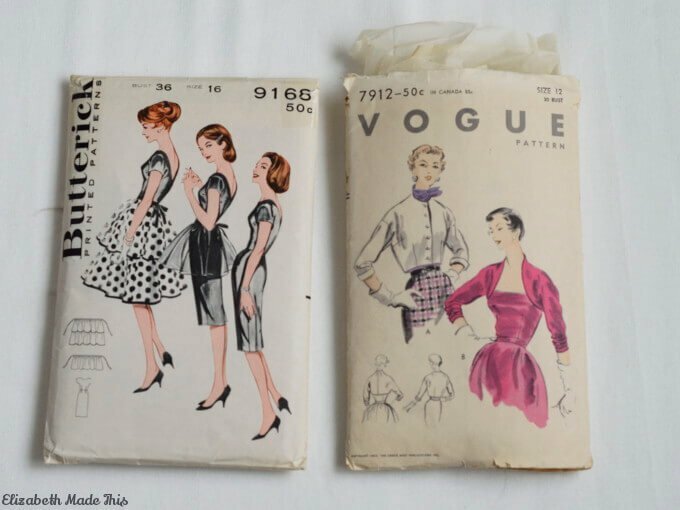 Typically, I avoid a lot of alterations by grading down the neck and shoulders of all patterns at least one size to a size 32 in European patterns and various sizes in other patterns. I also have to shorten hems and sleeves. These two alterations I do immediately, without question, but sometimes I encounter a more challenging fit problem. Though this is a simple dress in theory, the sleeveless armhole took me a long time to get right. I’m short proportionally between my shoulder and my bust, so sleeveless armholes always have too much circumference. The end result is that the armholes dip down too low and my bra shows. Not exactly a classy look, and it’s really uncomfortable. I didn’t have time this week to make a muslin for this dress as I would normally to check the armhole. Instead, I found myself reverse-engineering the fit to get what I needed. Ultimately, I think I ended up with a better fit than the times I’ve tried to conquer sleeveless armholes. To make the armhole smaller (which in turn raises the armhole to an appropriate level), I took out 2″ from the bottom of the armhole, tapering down to zero 3.25″ below into the side seam. There was a little excess fabric in the bust, so I could confidently take out what I needed in the side seam without ending up with an unwearable dress. The back armhole also was gaping a little, so I pinned out 5/8″ from the back armhole edge. Not wanting to have a visible dart in the back armhole, I rotated this excess out into the shoulder seam. The excess taken out tapers to zero at the back shoulder’s neck edge. Usually I do horizontal folds out of the front and back and the sleeve if I need to “petite” a pattern, but this raises the neckline. Since the neckline depth was already at a height I liked, I was glad to have discovered an armhole alteration that not only doesn’t affect the neckline, but one that I could change after the fact. There’s some pieces of RTW in my closet that I’m totally pulling out and fixing with these alterations! I really like how the color of the bolero picks up the browns in the floral print. Silhouette-wise, I think the jacket and the dress work really well together too. Though it’s a sleeveless dress, this will be a good transition piece for me into fall. Our falls tend to stay warm for a long time. I can always add a layering tee under the dress for an extra bit of warmth if needed. I loved making both of these garments! Now I have 2 pieces to combine with a jacket I’ve always wanted to wear! 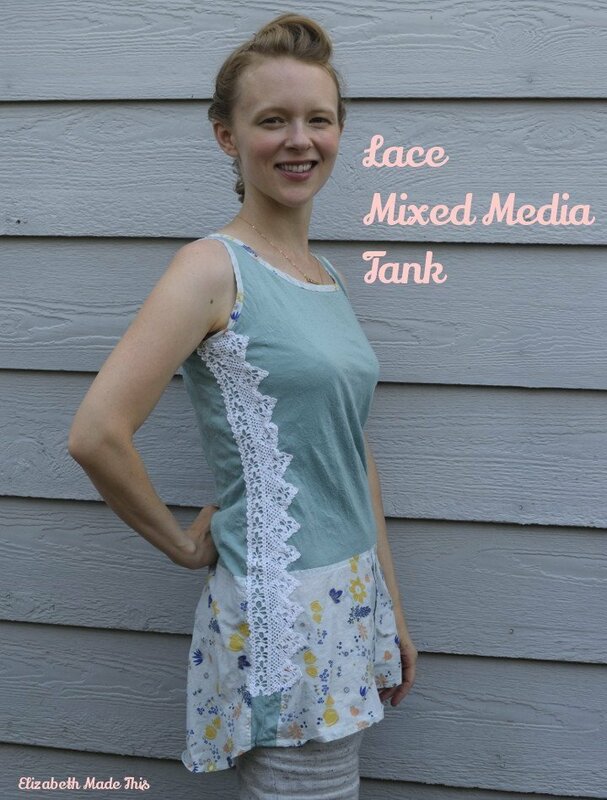 You can check out the other participants’ entries and vote for my dress and top at the Fabric Mart blog. I love how Anthropologie uses fabric, but I don’t often often copy their stuff literally. This tank was an exception. I like the woven bottom together with the lace stitched on top of the side seams combined with the comfort of a knit top. 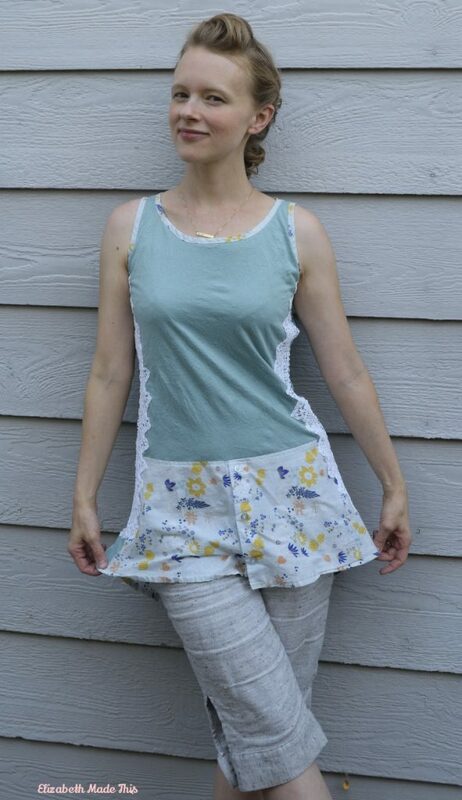 The resulting tunic is just the kind of flowy summer top that I was looking to make. In terms of patterns, I combined no less than 3 patterns to get to my final pattern. The tank part is Straight Stitch Patterns’ Greenwood Tank. I liked with that pattern how the shoulder hit well enough to cover my bra line (not necessarily a given with tank patterns), but the armholes were too big. I used my trusty Jalie 2921 to modify the Greenwood armscye to the circumference I was looking for. 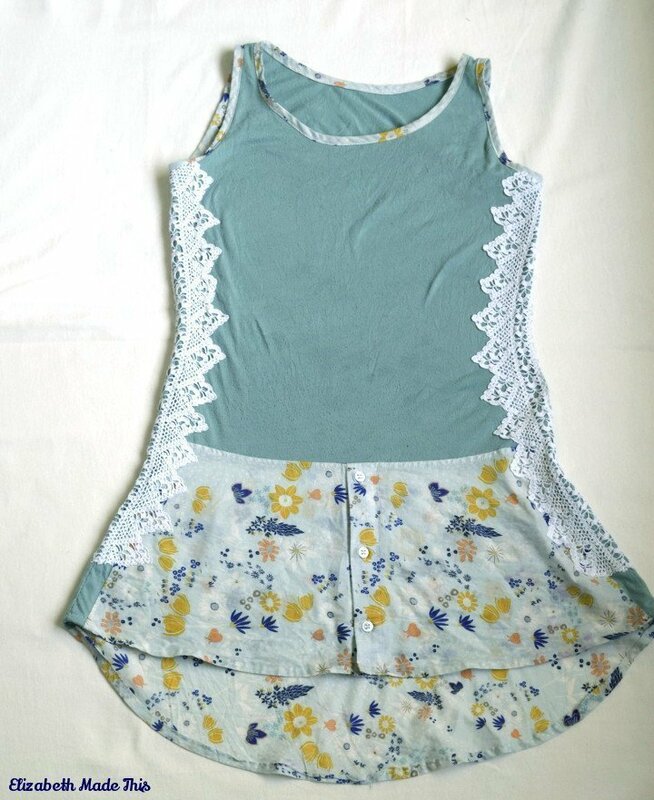 The woven part of the tank is a modified version of the high/low peplum piece from Blank Slate’s Marigold. For fabric, I used a cotton voile on the peplum leftover from this Mississsippi Ave dress. I added a CF button placket to make it look like it’s the bottom of a men’s dress shirt. I cut the same voile in bias strips to bind the neckline and armholes too. The knit is from an old t-shirt that I’ve had for several years. I originally bought it soon after my 2nd son was born. I always liked the color, but not the poofy 3 layered flutter sleeves it had. They were cumbersome to wear and I couldn’t wear a cardigan with the top because the sleeves were too bulky to fit inside the sweater sleeves. I carried a little bit of the green down into the sides of the peplum because…hips! It also is a nice contrast under the lace. Proportionally the top is overall a bit too long on me. If I repeat this design, I will definitely shorten the knit and the peplum as well as ditch the high/low element in favor of a straight hem. Overall, I really love this top. 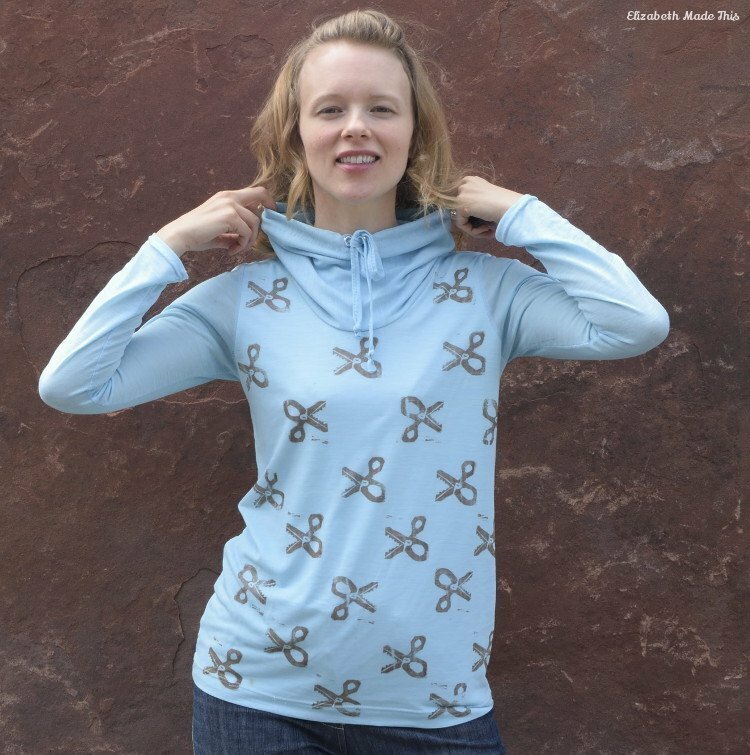 It was a good challenge to use multiple materials and patterns to get at the final top, and it’s super comfortable and lightweight for the summer heat. My Monthly Stitch Post on this top is here. My review of the Greenwood Tank is here. What’s the max number of patterns and/or fabrics you’ve combined into a finished garment? I’ve read The Renegade Seamstress for a long time now, and I’ve always enjoyed Beth’s Refashion Runway. I had hoped to compete this year, but this season is an All-Stars edition. I’m in the middle of just getting my sew jo back post baby and starting to sew for a couple of local boutiques who like my work. I might be biting off more than I can chew to try and sew along with the contestants, but I’m going to give it my best because refashioning is very much the theme of my work for the boutiques. This kind of challenge really fires up my brain in the right direction. My contribution to this week is this very 80s zipper top. This week’s theme is velvet. I asked, and Beth mercifully granted my request of using velour instead. I say mercifully because velvet is not a fun fabric to sew with. The high pile makes for layers that shift continuously. It also has very little stretch, so you can’t really ease the layers back together when they shift like you can with other fabrics. Velour on the other hand is not so terrible to sew with. Being a knit, it does ease relatively well, and the layers don’t shift quite as badly as with regular velvet even though they can stretch out of shape. Plus, I had a velour hoodie on hand. It’s missing an arm because I used it for another project. I decided to go for a top that would use the velour plus some rib knit from a maternity hoodie that I bought at the beginning of this pregnancy. I liked the color and had already planned to refashion it after my daughter was born. It always takes me a while to get back into my sewing/writing/doing life routine after having a baby, and this time I’ve been trying to not be hard on myself about it. I went through so much sickness after my youngest son, I’ve been careful not to go overboard. After 3.5 months, I think I’m finally gaining enough energy back to do something beyond the absolutely necessary, so you can consider me back from maternity leave as it were. And what a way to get back in the swing of it all than with a colorblocked workout top? I didn’t intend to not write for nearly 4 months, but as it has turned out, I’ve needed very little in the way of clothes this pregnancy. The advantage of having had previous pregnancies that started at a heavier weight is having more than plenty of clothes for the last few weeks when it feels like nothing fits. But I did go ahead and make this fringe collar dress. I had this lovely fringe trim leftover from my tablecloth dress, and I’ve been looking for the right project to use some of it. Hey, and fringe is in right now! Yay! After months of absence at the Monthly Stitch, I finally could finish a challenge! 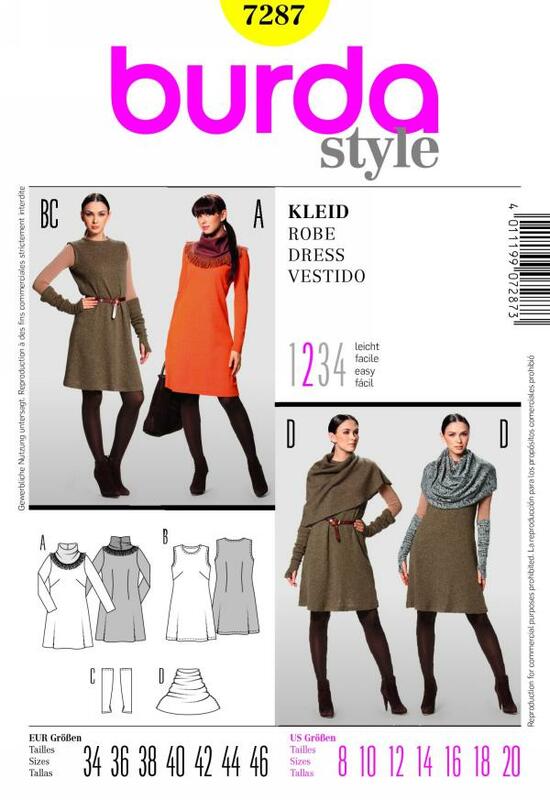 I made Burda 7287 some time ago after being inspired by Kyle’s version, and it has become one of my favorite winter dresses. Paired with or without the detachable collar, and the fingerless gloves that I wear literally all winter, it’s been a versatile staple in my wardrobe. 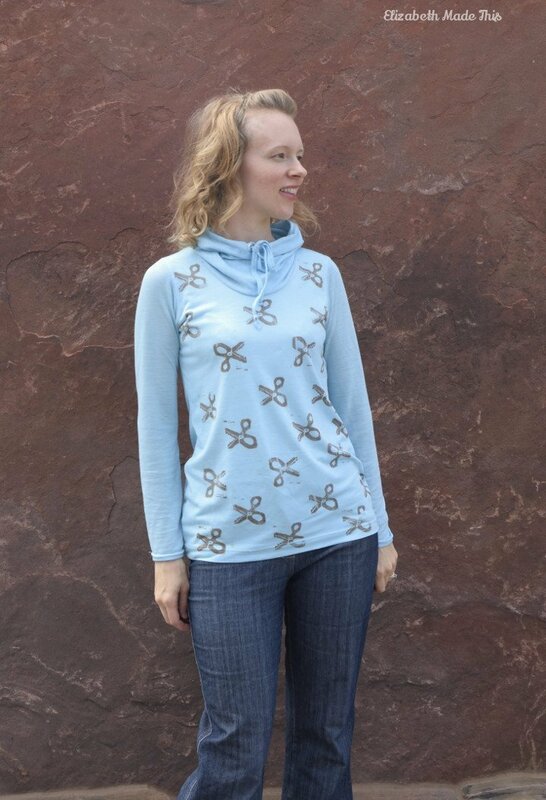 For this project, I decided to make the other view on the pattern where you sew on the collar at the neckline and add trim to the bottom edge of the collar if you like. I cut the main part of the dress from some really nice interlock that I scored at the thrift store a couple of years back. It was one of those days where fortune favors the person willing to go a hunting through the muck and mire when I pulled out this fun black and white print made by Kaufmann. There was no less than 5 yards of it and I paid $3 or $4 for it. It’s soft and does not stretch out at all like a lot of interlocks do. It’s stable enough too that I’ve used some of it to muslin dresses I make in ponte like my opera dress. Still, I don’t wear black. * So I knew I needed a way to break up the black so I didn’t get the horrid zombie look that I get when I wear it. *Well, I will wear black if I’m contractually obligated, i.e. a violin gig, but I’m never happy about it. I found an XL rib knit sweater in one of my blues while a thrifting one day and I loved the springy feel it had. Remembering how soft a rib knit sweater had made my Denver Tunic, I decided to combine the blue with the black and white. It would keep the black away from my face and make for a cozy collar that would look great with the added tablecloth fringe. Keeping the black away from my face. The pattern’s sleeve is well past full length on me, which makes sense given that the arms are intended to have thumbholes. Though I’ve tried many many times to create a good solution for thumbhole tops, I’ve never really been comfortable wearing them, and these are no exception. In past tops, I’ve done what patterns suggested, just leaving a gap in the side seam which inevitably twists and is generally so small that it cuts off the circulation to your thumbs. To avoid numb thumb, I cut a 1″ square where my thumbs hit and then used some of the rib knit to bind the edge of the hole. Now, there’s more than plenty of room for my thumb and the base of my thumbs, so there’s no chance of the blood being cut off to my thumbs. 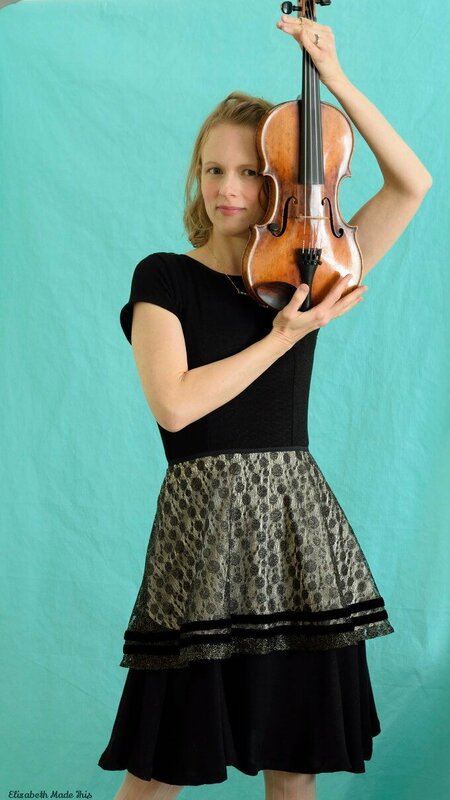 Still, the thumbs pull on the sleeve when I have my arms extended, like when I’m driving or playing my violin, and they sadly do not offer me any extra warmth. So next time, I’ll stick with either the sleeveless version with added fingerless gloves, or simply shorten the sleeves to a normal full length on me. I think thumbhole tops are just simply not my thing along with wrap dresses, maxi dresses, and button-down shirts. As for fitting, I merged this pattern with Burdastyle 6-2010-132 which is a crossover style maternity dress. I always loved how the Burdastyle pattern fit. A lot of maternity patterns have excessive ease, flare and gathering that just ends up making you look and feel like a marshmallow, but this one is cut in a really slimming sort of way. It gives you enough room for the growing baby, but nothing crazy beyond that. Still, I’m kind of over crossover styles. I had experimented with merging this pattern with my normal t-shirt for a pajama top, and I liked my experiment enough to go ahead with a dress. 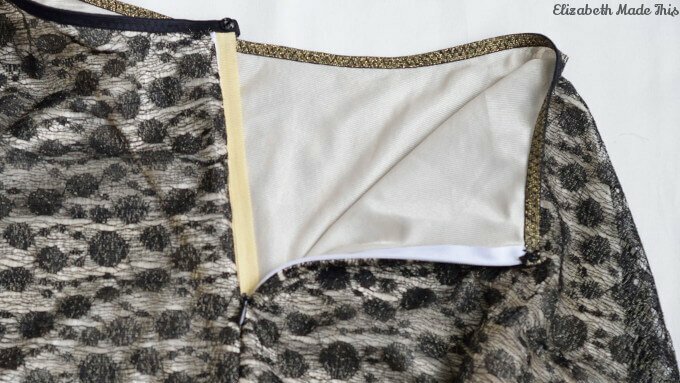 All it required me to do was to match up CF lines, overlap the crossover section with the lower front panel at the seamline and use the neckline of the non-maternity dress and the outer edges of the maternity panel where it was needed. No extra tracing, no extra fitting or pattern work. This was a fast and dirty alteration. 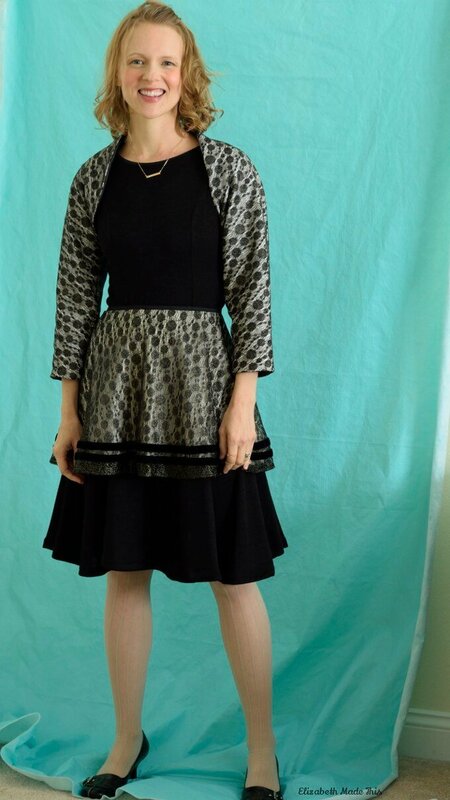 I did keep the seam allowances bigger than I otherwise would have, and I simply sewed them instead of serging them off or trimming them as I would have on a regular knit dress. My logic was that I’d only be wearing this as a maternity dress for 2 months tops. With the extra seam allowances intact and unfinished, it’ll be easy for me to go back and open up the front, removing the elastic and cutting it to fit the original lines of the non-maternity pattern. My favorite feature is the collar. The rib knit drapes so well, adds a nice layer of warmth and looks great scrunched up with a vintage brooch. Overall, it was good to get back in the saddle before all the craziness happens in a month or so with my body being any number of sizes. My updated review is here. How much have you ever made for your own pregnancies? Do you shelve your machine momentarily, relying on RTW maternity options, or sew up a storm to weather the season? I was hoping to get this up when the article came out last week, but one thing led to another, and now I’m playing catch up. 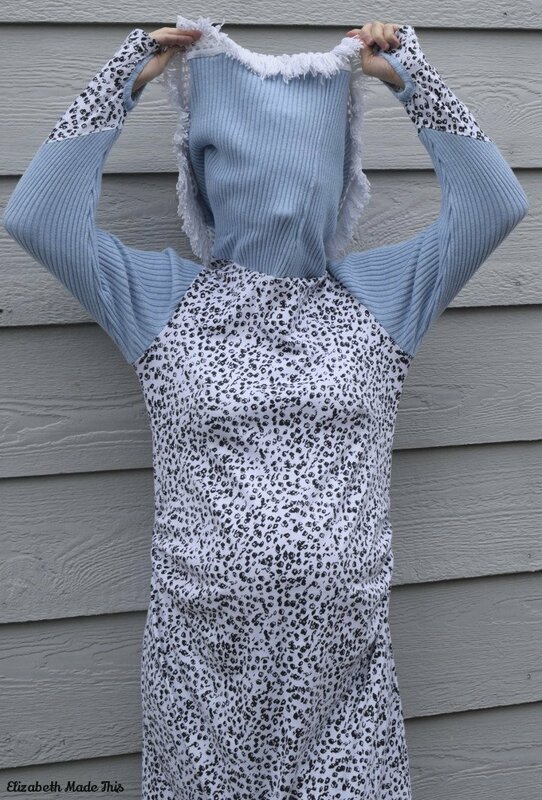 If you haven’t seen it, I wrote a tutorial over at Up Craft Club to show you how to add a drawstring cowl to a t-shirt. This is the perfect tutorial as we (hopefully) are heading into fall. Come fall, all I want to wear and make are big fat cozy tops with huge scarves. Cowl necks are even better because the scarf is attached. Some time ago I had been mulling over the idea of adding a drawstring cowl to my favorite t-shirt pattern. I had seen one of the many sporty ladies I come across in my daily life wearing something similar, and I liked the casual touch that the drawstring added to a neck shape I already loved. The time seemed right to figure out how to make it happen. It’s crazy easy to adapt a pattern to add this feature. This tee I made up from a soft poly jersey from Cali Fabrics. I blockprinted the front using a pinking shear stamp that I carved a while back and an ink pad suitable for fabric after heat setting. It turns out, I really like how clear the stamp impressed on the fabric using the ink vs. screenprinting ink that I have been using for blockprinting. It also is completely flat, or rather, there’s no added dimension of chunkiness on the fabric from any kind of paint, so the hand is completely smooth. I haven’t sent it through the wash yet, and no doubt I will send it through a cycle on the dryer to hedge my bets on the heat setting directions. The jury is still out as to whether the ink will survive the wash, but I have my fingers crossed! So if you’re longing for a big cozy cowl this fall, check out this quick and easy tutorial right here. Today I’m writing over at UpCraftClub! Check out my first post over there where I’m sharing a way to incorporate mixed prints into your next Lane Raglan tee. 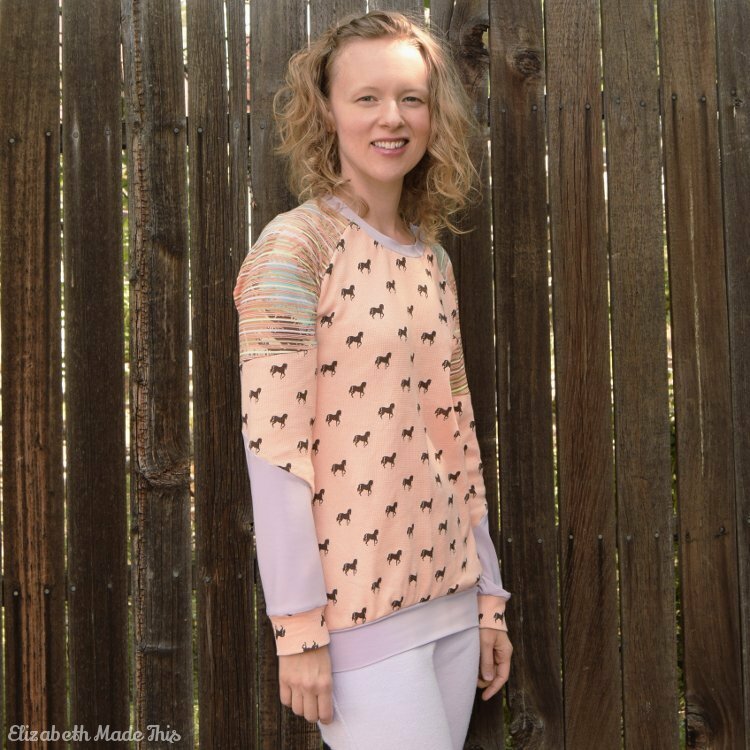 I’ve been dreaming up a pair of fall/winter pajamas made from this great peach pony thermal knit fabric, but the store that I bought it from was going out of business, so I had limited yardage to play with. After sorting through my scraps, I found some great coordinating fabrics. With a little pattern hacking, I combined everything into a very cozy pair of pajamas which, no doubt will serve me well when it stops being a million degrees outside. You can read all about my process and see my tutorial for this particular pattern hack here.